Your blog. Whether you’re a single-person shop or a multi-person company, your blog – if it’s a good blog – can be your greatest asset. It’s content that you can use over and over again, in ways you perhaps didn’t think you could. But… what makes a “good” blog? Here are some tips to turn your blog into a really good blog that will work for you long beyond its posting date. Your perfect potential customers, the people you really want to engage and turn into actual paying customers, are no doubt faced with challenges, problems, or needs that you can address. Nearly everything that is sold, whether a product, a service, or a program, answers SOMETHING that your readers are experiencing. Get to the heart of the “why factor” in your story: explain why it matters, and do it near the top of your post. Think about the “because.” People do X because… and people do Y because. Are you a yoga instructor? Why do people take yoga? Do you sell original art? Why do people buy original art? Do you sell a needed service to businesses? Why do people buy that service? Pro Tip: Pinpoint your story to ONE key point. Don’t try to have one blog post do too much, because when you try to talk to everyone, you’re talking to no one. Address only one of the “why factors” and save the others for separate posts at a later time. Ask yourself this: what’s the key takeaway I want people to have after reading this post? Yes, to go back to the yoga example, people do yoga for different reasons. Aim your story at only one of those reasons. Optimum length for your blog posts is between 500 and 800 words. If you sometimes go up to 1000 words, it’s okay (provided you’re following the other tips below). Don’t be less than 500 words if you want your blog post to be indexed by the search engines. If your posts lends itself to a list in the middle somewhere, use bullets or numbers to make it look different from your other content. Try to keep your list to five items or fewer. Use images – but don’t over-clutter your post with them. While I suggest you keep your images relevant to the content, I freely admit that sometimes the relevance is only in my head. Pro Tip: If you have so much to say that your blog posts will be way over 1000 words, break it into two or more posts. Also, use links in your blog post. Include outbound links in your post. Those are links to content other than your own, like I did earlier with the two YouTube links. BE SURE that you take the extra step to have the link open in a new window, though, or you could lose your blog reader mid-way through your post. 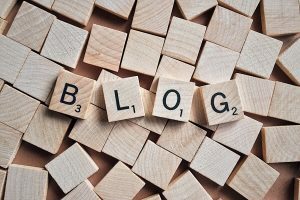 Cross-link your blog post to other blogs posts or pages on your site. This is called inter-linking, and, like outbound links, strengthens your blog in the eyes of the search engines. If you’re part of a community, it is very nice to link to others who complement your own offerings – and it could be the start of a lovely you-link-to-me-and-I’ll-link-to-you relationship – especially if someone else’s post is tied into the same “why factor” that is the topic of your post. To build authority and trust, link to other authorities in your field – even to government postings, news networks, and online authorities. While those authorities may never know you did it, you’ll be showing your audience that you are a resource for them. Every blog post you write needs a call-to-action (CTA). However, your call to action should NOT be “click here to set an appointment” or “click here to see how we can help you.” You’re not there yet. Those are classic bottom-of-the-funnel calls to action, and, if that’s all you have, you’ll have more lurkers than leads. People who are not ready to buy are not going to take you up on a bottom-of-the-funnel call to action. To get those lurkers to turn into leads – to voluntarily join your list, you want an offer they’ll love. What can you create that your readers will find valuable? How can you entice them when they are at the top of the funnel, thinking that maybe you or your company could be exactly what they’ve been seeking? If someone is reading your post, what would they want next? What can take them one inch down the funnel? What will cause them to turn from a lurker into a lead (give you their email address)? We call this an “attractor,” and you’ll hear others call them lead magnets and even free gifts. Many people who provide marketing coaching suggest that your free gift is something you can advertise as a way to attract your perfect potential customers. They’re right about that. But it is ALSO an important way to engage people even further when they get to your blog. We’ve seen people experience success by using their ads to lead people to their blog posts, then capturing them on the blog post CTA. Pro Tip: You can create nearly any kind of attractor you might want using online tools like Canva. Attractors don’t have to be lengthy, complex documents. They can be short – even infographics or single-page documents. For more on attractors, see this post. Create Headlines that ZING ! Yes, send it to me! I want to create great headlines!